مخروط­های اسکوری از بارزترین بخش­های آتشفشان‌های کواترنری خاور کردستان هستند. در بررسی سنگ­نگاری این واحدها کانی­های اصلی به ترتیب فراوانی شامل الیوین، پیروکسن، پلاژیوکلاز و بیوتیت با بافت غالب حباب­دار و شیشه­ای است. در این مطالعه فرایند تشکیل و رشد حباب­­ها در طی فوران واحد­های اسکوری آتشفشان­های منطقه با استفاده از روش توزیع اندازه حباب­ها و با استفاده از محاسبه فراوانی، سهم حجمی، مدل‌سازی سه‌بعدی، هسته­بندی و رشد حباب­ها مورد بررسی قرار گرفته است. در 8 نمونه انتخابی از مخروط­های مختلف تعداد 3623 حباب ترسیم و شمارش شدند که سهم حجمی حباب­ها از 40 تا 85 درصد متفاوت است. با استفاده از تصویر دوبعدی حباب­ها شکل سه‌بعدی آنها بازسازی و با هم مقایسه شده­اند. بیشترین جمعیت حباب­ها در 4 نمونه دارای شکل کروی یا نزدیک به کروی و برای چهار نمونه دیگر بیضوری است. کشیده­ترین بیضوی در بین تمامی حباب‎ها نسبت قطرهای 2:8/1:3 (S:I:L) دارد که تقریباً یک بیضوی پهن است. راستای قطر Lهمان راستای عمود بر سطح است که کمترین فشار به ماگما وارد می‌شود و حباب قادر به رشد چند برابری در آن راستا شده است. وجود 2 تا 5 قله در نمودار توزیع فراوانی اندازه حباب­ها، نشان‌دهنده رخدادهای هسته‌زایی مجزاست که توزیع پلی­مدال، نمایی و توانی را برای حباب‎های موجود در اسکوری‌های خاور کردستان پیشنهاد می‎کند. به ترتیب از نسل اول تا نسل آخر نمونه­ها چگالی هسته­بندی افزایش و رشد حباب­ها کاهش می­یابد. تکرار رخداد تشکیل حباب‌ها در مقیاس ماکروسکوپی تا میکروسکپی و SEM، همچنین مدل هسته‌بندی و رشد آنها پدیده فراکتال را پیشنهاد می­دهد. Scoria cones are one of the main parts of East of Kurdistan volcanoes. Olivine, Pyroxene, Plagioclase and Biotite are main phonocrystals with Amygdaloidal-glassy matrix. This paper was studied processes of bubbles nucleation and grow during the eruption of scoria's unite using the Bubble Size Distribution (BSD) method including study of population density, bubbles volume, 3D modeling, nucleation and bubble growth. For selected sample from different cone, in total was measured 3623 bubbles and drawn that bubbles volumes calculated from 40 to 85 percent. Using the 2D bubbles shape renovated 3D bubbles schematic shape and compared together. Most population for four samples bubbles shapes are near to sphere and for other four samples are ellipsoid. Longest ellipsoid bubbles shape has 1:3.2:8 diagonals ratio that it’s flat ellipsoid. The longest diameter (L) is perpendicular to the surface and parallel to lower pressure dictated on magma and bubbles could be growth more than other sides. Presence of 2-5 peaks in frequency distribution versus bubble size diagram, suggesting unimodal, polymodal, exponential and power low events for bubbles generation in the east of Kurdistan Scoria's. Nucleation density increased from first to lasts generation but bubbles growth reduced. Recur of bubble forming in macroscopic samples, microscopy, SEM and nucleation and grow model suggested fractal model. حسینی، م.، موسوی، ف.، کریمی نلا، م. و سهیلی، م.، 1379- نقشه زمین شناسی 100000/1 بیجار، سازمان زمین شناسی و اکتشافات معدنی کشور. رحیم زاده، ب.، مسعودی، ف. و رنجبر، ش.، 1393- مطالعه ویژگی‎ها و شکل‎گیری حباب‌ها در طی فوران واحد اسکوری آتشفشان دماوند. فصلنامه علوم زمین، سازمان زمین‌شناسی و اکتشافات معدنی کشور، شماره 92، صفحه 11 تا 22. شیخ‎ذکریایی، س. ج.، اشجع اردلان، ا. 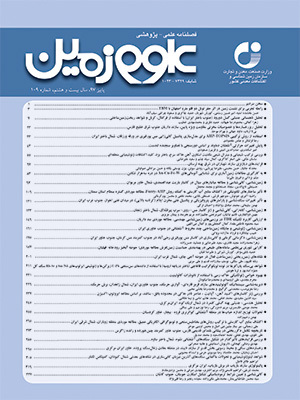 و طربی، س.، 1393- پتروگرافی و ژئوشیمی سنگ‎های آتشفشانی بازیک کوه قرینه، شمال خاور قروه باختر ایران. فصلنامه زمین‎شناسی محیط زیست، سال هشتم، شماره 27، تابستان. ص 63. فنودی، م. و صدیقی، ا.، 1384- نقشه زمین‎شناسی 100000/1 بیجار، سازمان زمین‎شناسی و اکتشافات معدنی کشور. معین‎وزیری، ح.، 1375- دیباچه‎ای بر ماگماتیسم ایران، انتشارات دانشگاه تربیت معلم (خوارزمی)، 374 ص. ملکوتیان، س.، وثوقی عابدینی، م.، قربانی، م. و حق‎نظر، ش.، 1386- شواهد ایزوتوپی از پوسته قاره‌ای در سنگ‌های بازیک کواترنری محور قروه- تکاب، فصلنامه علوم زمین، سازمان زمین‌شناسی و اکتشافات معدنی کشور. Allen, M. B., Kheirkhah, M., Neill, I., Emami, M. H. and McLeod C. L., 2013- Generation of arc and within-plate chemical signatures in collision zone magmatism: quaternary lavas from Kurdistan Province, Iran J. Petrol., 54, pp. 887–911. Blower, J. D., 2001- Degassing Processes in Volcanic Eruptions. Ph.D. Thesis, University of Bristol. Blower, J. D., Keating, J. P., Mader, H. M. and Phillips, J. C., 2002- The evolution of bubble size distributions in volcanic eruptions, vol. 120, pp.1-23. Boccaletti, M., Innocenti, F., Manetti, P., Mazzuoli, R., Motamed, A., Pasquare, G., Radicati, di Brozolo, F. and Amin Sobhani, E., 1977- Neogene and Quaternary volcanism of the Bijar Area (Western Iran), Bull. Volcanol., Vol. 40, pp. 121-132. Burnard, P., 1999- Eruption dynamics of ‘popping rock’ from vesicle morphologies. J. Volcanol. Geotherm. Res. 92, 247- 258. Cashman, K. V. and Mangan, M. T., 1994- Physical aspects of magmatic degassing. 2. Constraints on vesiculation processes from textural studies of eruptive products. In Volatiles in Magmas, of Reviews in Mineralogy, vol. 30, pp. 447–78. Gaonac’h, H., Stix, J. and Lovejoy, S., 1996- Scaling elects on vesicle shape, size and heterogeneity of lavas from Mount Etna. J. Volcanol. Geotherm. Res. 74, 131-153. Giachetti, T., Druitt, T. H., Burgisser, A., Arbaret, L. and Galven, C., 2010- Bubble nucleation, growth and coalescence during the 1997 Volcanoes explosions of Soufriere Hills Volcano, Montserrat. Journal of Volcanology and Geothermal Research 193, 215–231. Gonnermann, H. M. and Manga, M., 2007- The Fluid Mechanics inside a Volcano, Annu. Rev. Fluid Mech. 39:321-356. Downloaded from arjournals.annualreviews.org by University of California - Berkeley on 12/21/06. For personal use only. Heiken, G. and Wohletz, K., 1985- Volcanic Ash. Uhiversity of California Press.246 pp. Heiken, G., 1972- Morphology and petrography of volcanic ashes. Geol. Soc. Am. Bull., 83:1961-1988. Higgins, M. D., 2006- Quantitative textural measurements in igneous and metamorphic petrology. Cambridge University Press. 277pp. Klug, C. and Cashman, K. V., 1994- Vesiculation of May 18, 1980, Mount St. Helens magma. Geology 22, 468-472. Mangan, M. T. and Cashman, K. V., 1996- The structure of basaltic scoria, reticulate, and inferences for vesiculation, foam formation, and fragmentation in lava fountains. J. Volcanol. Geotherm. Res. 73, 1-18. Mangan, M. T., Cashman, K. V. and Newman, S., 1993- Vesiculation of basaltic magma during eruption. Geology 21, 157- 160. Marsh, B. D., 1988- Crystal size distribution (CSD) in rocks and the kinetics and dynamics of crystallization I. Theory. Contrib. Mineral. Petrol. 99, 277-291. McBirney, A. R. and Murase, T., 1970- Factors governing the formation of pyroclastic rocks. Bull. Volcanol. 34:372–84. Morgan, D. J. and Jerram, D. A., 2006- On estimating crystal shape for crystal size distribution analysis. Journal of Volcanology and Geothermal Research 154,1–7. Orsi, G., Gallo, G., Heiken, H., Wohletz, K., Yu, E. and Bonani, G., 1992- A comprehensive study of pumice formation and dispersal: The Cretaio Tephra of Ischia Italy. J. Volcanol. Geotherm. Res. 53, 329-354. Proussevitch, A. A. and Sahagian, D. L., 1996- Dynamics of coupled dilution and decompressive bubble growth in magmatic systems. J. Geophys. Res. 101, 17447-17455. Rust, A. C., Manga, M. and Cashman, K. V., 2002- Determining low type, shear rate and shear stress in magmas from bubble shapes and orientations. Journal of Volcanology and Geothermal Research 122 (2003) 111-132. Sarda, P. and Graham, D., 1990- Mid-ocean ridge popping rocks: implications for degassing at ridge crests. Earth Planet. Sci. Lett. 97, 268-289. Sparks, R. S. J. and Brazier, S., 1987- New evidence for degassing processes during explosive eruptions. Nature 295, 218-220.URASE. Sparks, R. S. J., 1978- The dynamics of bubble formation and growth in magmas: A review and analysis. J. Volcanol. Geotherm. Res. 3, 1-37. Whitham, A. G. and Sparks, R. S. J., 1986- Pumice. Bull. Volcanol. 48, 209-223.